City Farm is competing for a prize in the category of landscape design. 60 countries compete in world’s largest building design fair. 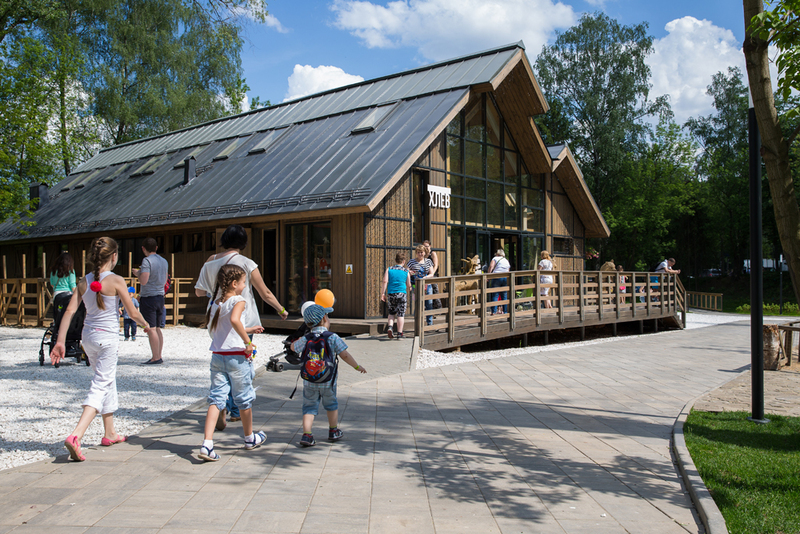 City Farm, an educational center in Moscow’s VDNKh Park and Exhibition Complex built in 2015 by the Wowhaus design firm, has made the shortlist of finalists at the World Architecture Festival 2016. It was here that the famous goat Timur underwent rehabilitation after his quarrel with the tiger Amur. The complex is located in the park on the banks of a pond. It includes workshops, open spaces for special events and a contact zoo with goats, cows, rabbits and ducks. A traditional “rural” style with span roofs and natural materials comprises the basis of the farm’s design. The project occupies about three hectares. The project was designed by Wowhaus, a company founded by architects Dmitry Likin and Oleg Shapiro in 2007. The firm covers all fields of architectural design, but over the last few years it has focused on the architecture and design of public spaces – ranging from urban parks to the development of city-planning strategies. The World Architecture Festival has been bringing architects together since 2008 to share experiences, learn about groundbreaking ideas and find new inspiration. It is also the world’s biggest contest of architectural projects. This year’s winners will be announced in Berlin from November 16-18.